I saved this recipe from "With a Cherry On Top" from February and made it for R. I have made Lava Cakes before with recipes very similar to this one and they've all come out delicious - the key is knowing your oven and being able to determine how long to leave them in. 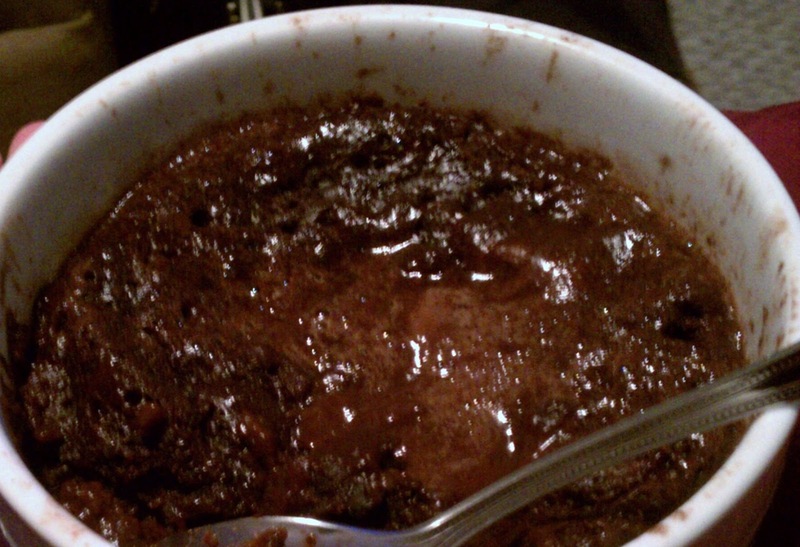 I made one last year with a little instant expresso powder and it was also very good, brings out the chocolate but cuts the sweetness. We DEVOURED them straight from the oven! Preheat the oven to 425*F. Prep two ramekins (I used 5 inch ones) by buttering them and dusting them with cocoa powder. In a double boiler melt the butter and chocolate over medium heat, stirring frequently and let cool. In a large bowl beat the eggs, sugar, and salt until the sugar dissolves (approx 1 minute). With the mixer on low, slowly add in the chocolate mixture until incorporated. Add the flour and mix to combine. Divide batter between the ramekins and place on a baking sheet. Bake for 8 minutes (I needed 10-11 minutes) and remove. Let cool slightly and gently seperate the sides with a butter knife. Serve with whipped cream and a dusting of powder sugar or top with thinly sliced strawberries. We just ate them out of the ramekin but they are very pretty plated! We don 't have time for that in this house, messy in the ramekin is fine with us. Suit up and meet me at the beach!